e. They have to obtain entire at least CGPA 6.50 (without 4th subject) together of SSC & HSC examination. 2. Applicant SSC and HSC Roll, Board Name, Passing Year and Registration Number Input. 3. Click next step and select your Quata (if any), Mobile number and other information input. 4. You Will get a pin no. now pay application fee by using Dutch Bangla Mobile Banking. 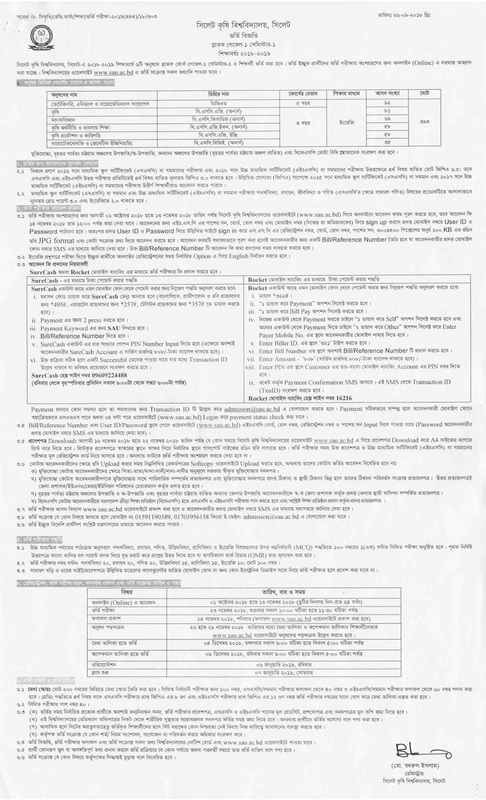 d. Type Input Sylhet Agricultural University (SAU) Biller ID as 321.
e. Answer field press Bill Number input 6 (six) number digit Application Id. f. Answer field press BDT 808/-. g. After the completion of the receipt of the Transaction ID message will be received from a number 16216 with a confirmation. h. Input your PIN Number of DBBL and Complete the payment. b. Select 2 for Bill Pay Option. d. Enter Bill Number which Provide you just, after Online Application. Bill Number Means your Application ID. e. After the completion of the receipt of the Transaction ID message will be received with a confirmation. f. Input Your PIN Number and Complete the Payment. After complete the payment successfully reserved the transaction ID and visit http://www.sau.ac.bd put your appliaction ID and Transaction ID and submit and dwonload your admit card. 16/11/2018 to 22/11/2018 will published admit card http://www.sau.ac.bd. Every candidate Login their appliaction account and upload recent (300*300)pexel within 100KB color Photo u and download Admit card Print this Admit card A4 size paper. Jessore University of Science and Technology (JUST) Test admission authority will published seat plan before 03 (three) days on Visit http://www.sau.ac.bd. 24 November, 2018 will published Admission Test Result. 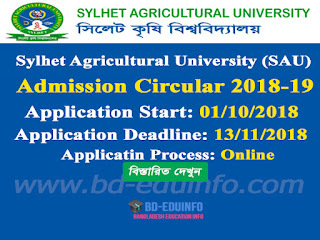 Any applicant can download and view from Sylhet Agricultural University (SAU) official website http://www.sau.ac.bd search their Admission Test Roll Number. 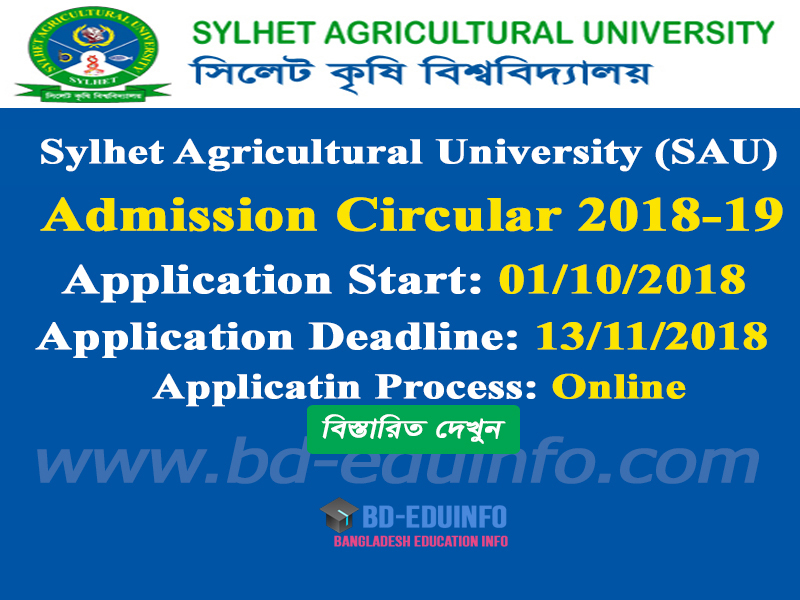 Tags: www sau ac bd, Sylhet Agricultural University (SAU) Admission Circular 2018-2019, Sylhet Agricultural University (SAU) Admission Test Result 2018-2019, Sylhet Agricultural University (SAU) Admission waiting list 2018-2019, SAU Admission Circular, SAU Admission Notice, SAU Admit Card Download, sau Seat Plan, sau Admission Mark Distribution, Sylhet Agricultural University (SAU) Mark Distribution 2018-2019, SAU Admission Test Result, SAU Undergraduate Online Application 2018-2019.
www sau ac bd, Sylhet Agricultural University (SAU) Admission Circular 2018-2019, Sylhet Agricultural University (SAU) Admission Test Result 2018-2019, Sylhet Agricultural University (SAU) Admission waiting list 2018-2019, SAU Admission Circular, SAU Admission Notice, SAU Admit Card Download, sau Seat Plan, sau Admission Mark Distribution, Sylhet Agricultural University (SAU) Mark Distribution 2018-2019, SAU Admission Test Result, SAU Undergraduate Online Application 2018-2019.